IWM (Industrial Washing Machines) is displaying at this year’s Pro2Pac the new CW13 EX BT cabinet washer as well as its popular T200 one man operated Traywasher. Visitors to the show will be able to view the new machines at stand S2329. With solid construction and user friendly operation, the new CW13 EX BT general-purpose cabinet washer is ideally suited for efficient batch washing of a wide range of items, including trays, machine components/change parts, weigh pans, buckets and utensils. The new cabinet washer has been designed with hygiene in mind, with an internal self-cleaning function and the interior of the machine being completely rounded with no right angles. 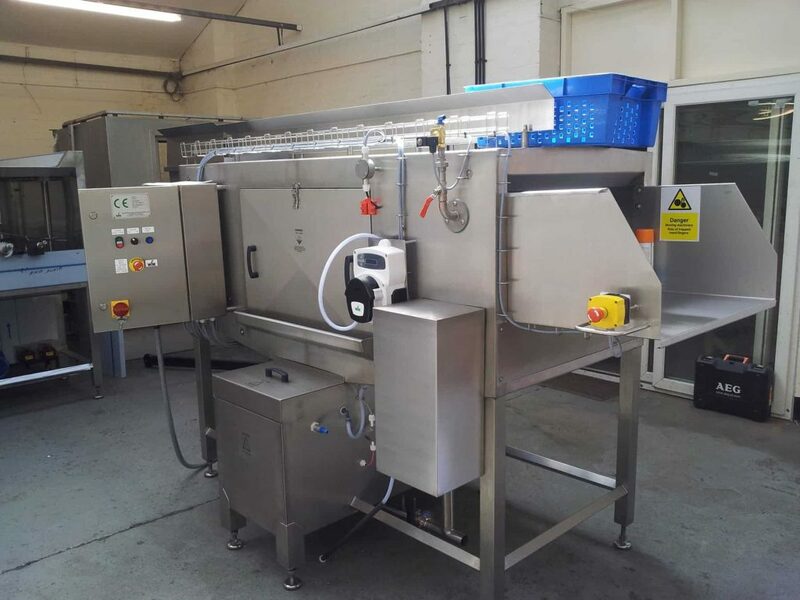 The machine is supplied with standard re-enforced pull-out washing trays measuring 1320 mm x 700 mm, and can accommodate items up to 820 mm high. For convenient handling of heavier items, such as machine parts, smaller trays are optionally available. Washing is accomplished by sustained jetting from rotating spray arms to ensure that all surfaces of the items to be washed are cleansed effectively. Supplied from an electrically heated tank, the wash water is automatically dosed with detergent. To minimise water, detergent and energy usage, the wash water is re-circulated via an efficient suction filter system that protects the wash pump and prevents residues from being deposited in the wash system. The CW13 also has a guaranteed high temperature rinse cycle, powered via separate pump and water feed. Each rinse cycle can be pre-programmed for time and temperature as part of the total washing cycle. The rinse cycle uses a maximum of 8 litres per cycle. The T200 is a single tray continuous wash machine ideal for low or intermittent throughputs and where space is an issue. The tray can accommodate 50-200 trays, crates or boxes per hour with a maximum size of 600 mm wide by 400 mm high. Built with stainless steel control panel to IP66 standard, the T200 comes complete with all necessary electrics including stop/start, emergency stop, category 4 safety circuits and low-level water and thermostatic protection for heater and pump components. In addition, the sustained 360° jetting with hot water and the detergent re-circulated from a heated tank make this machine a cost effective and energy saving solution. At Pro2Pac Show, IWM is focussing not only on the efficiency and low lifetime cost of its renowned industrial washing and sanitisation systems, but also on their outstanding environmental credentials.